The semiconductors group ARM was in focus last night, with traders buying in amid optimism about Apple’s latest offering. The stock was marked up by 5.4p to 246.3p after ARM and Germany’s Infineon emerged as the main suppliers for the iPad, which got off to a flying start on Saturday. The Californian tech giant said it had shifted more than 300,000 units on the day of the launch, driving hopes of royalties for ARM. 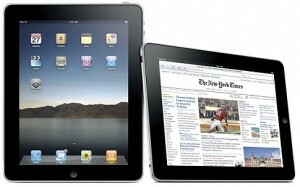 On RBS’s numbers, the company stands to collect about 35 cents per iPad. The 3G device, which will be out soon to supplement the Wi-Fi version, is slated to bring in about 45 cents per unit. “We currently assume that 16 million ARM-based internet tablets and electronic readers will ship this year, growing to 23 million next year,” RBS said, sticking to its “hold” view and 245p target price for the stock.